[miau] Emperor’s Garden is an online slot game put out in 2011 by NextGen Gaming, which is the slot development section of the NYX Gaming Group. If you are playing for the atmosphere, then the game has impressive artwork for you. The Emperor referred to in the name is one of the Asian Emperors who were famous for their beautiful and tranquil gardens. All the animation in the game centers around this theme, with classic willow tree branches and leaves in the background and lavender water dotted with lotuses in the foreground. The welcome screen visual is a girl in a pink robe spinning while playing a flute. The game uses the chirping of birds as part of their sound effects for a very nice atmospheric touch. This is not NextGen’s first Asian-themed slot game, but it is definitely the one with the most relaxing visuals and background music. Of course, the real draw is not the pretty art work. You want to know how to play. It’s a simple slot game: you match symbols from left to right on any active paylines. You can start betting at $0.01 a coin and go up to $2 a coin. There is a potential jackpot of $10000, which is an impressive pay-off for anyone not playing just for fun. The game gives out wins every few spins. The betting consists of 2 parts: you pick the number of lines activated, and then you pick the value of the coin you use per payline. The game has a gamble feature that allows any win to be gambled by pressing the gamble button. With this feature you can predict if the next card will be red or black, or you can try to guess whether the next game will be a Spade, Heart, Diamond or Club. This is a 5 reel game with 25 paylines. The symbols on the reels are the Emperor, stone Chinese lions, pagodas, bonsai trees, Koi fish, and Aces with lotuses. They, of course, also use card symbols 9 through King. You can find the payout table for information about these symbols by clicking the button under the reels that says ‘Info.’ It uses the Garden icon as its Wild symbol, which appears only on reel 2 to 4. It substitutes for all regular symbols except the Koi Carp Scatter. The Garden Wild expands to fill the reel, so you have more chances to win. The Koi Carp Scatter is interesting in itself. The fish that represent the scatter do a graceful swimming dance while dragonflies beat their wings on the side of the reels whenever the Koi form a winning combo. The game gives you the chance to win 10 free spins when you hit three Koi Carp. 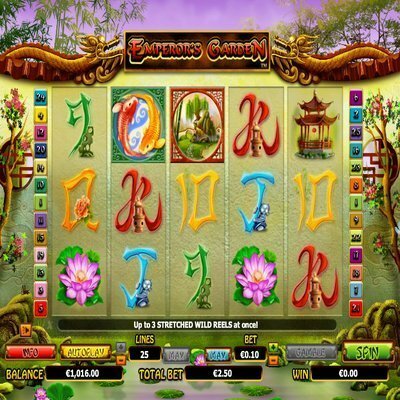 During the free spins, any Garden Wild triples the prizes. You can retrigger the free spins round, too. If you land on a minimum of 2 Koi fish, your rewards get multiplied. If you get 5 Koi fish, you can earn 100 times your bet. These Koi don’t even have to be on the same paylines. There is one bonus game, and the Wilds bump up the wins during this round. All in all, it’s a good game for relaxing online.